We expect a +39 Bcf change in the storage report for the week ended April 5. A storage report of +39 Bcf would be higher than last year's -19 Bcf and +9 Bcf for the five-year average. There won't be a natural gas bull market this year as the market is oversupplied by 2.37 Bcf/d at the moment. 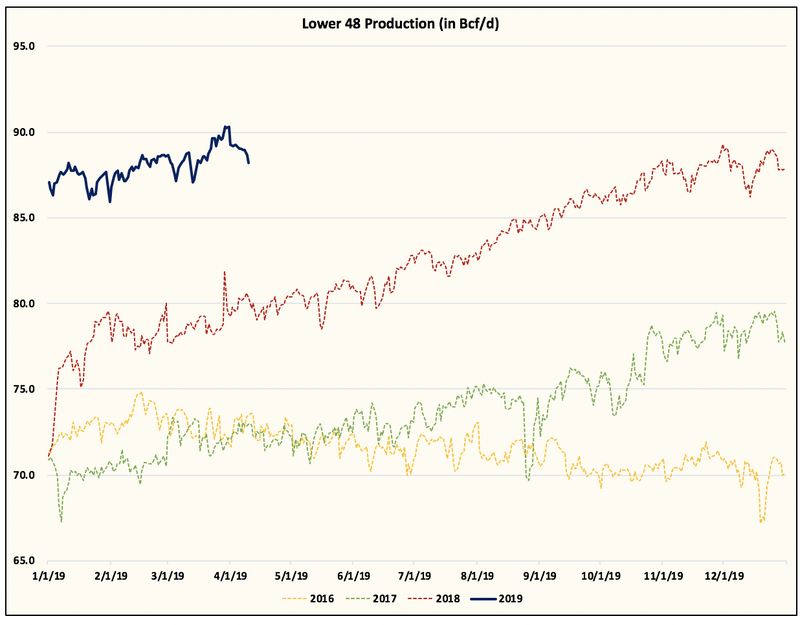 In order for 2020 to be a bull market for natural gas, production needs to stay flat into year-end. We think this is highly unlikely given the gas situation in Texas. 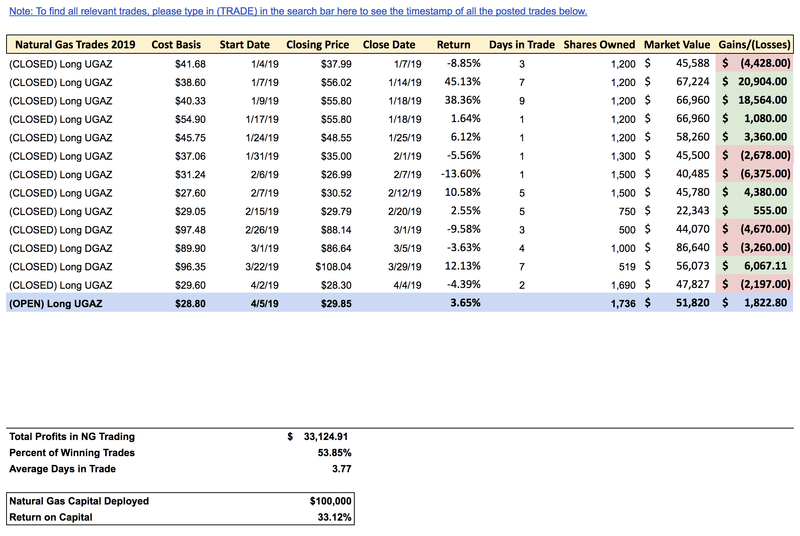 Welcome to the No Bull Market This Year Edition of Natural Gas Daily! We expect a +39 Bcf change in the storage report for the week ended April 5. A storage report of +39 Bcf would be higher than last year's -19 Bcf and +9 Bcf for the five-year average. We remain long UGAZ for a short-term bullish trade. Weather models continue to remain bullish with HDDs higher than the norm. This is not to be confused with our short-term bullish UGAZ position. 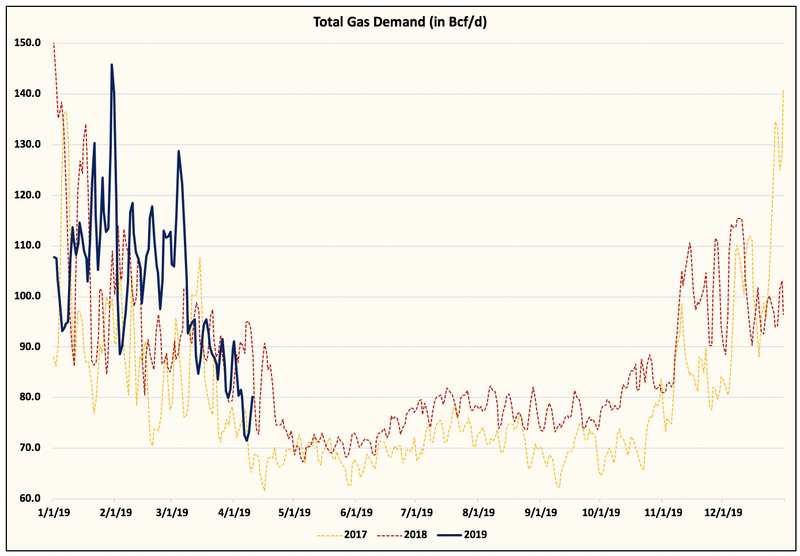 Our view is that natural gas will unlikely crack above $3/MMBtu for an extended period of time this summer. Why? This one chart explains it all. 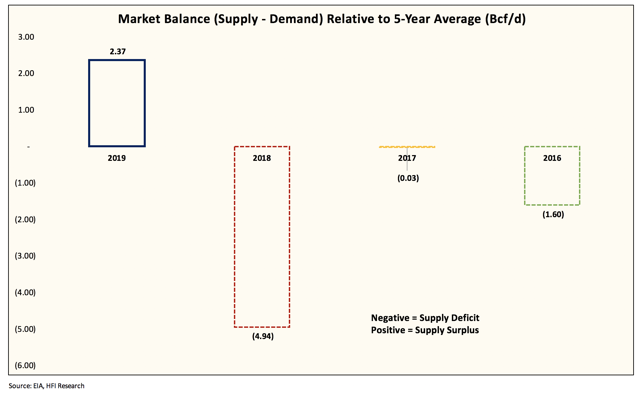 The natural gas market is some 2.37 Bcf/d oversupplied at the moment. One can thank the relentless Lower 48 production for that. With production some ~8 Bcf/d higher year over year, demand has not increased remotely the same amount to help offset the supply increase. And with April HDDs expected to come in just slightly higher than the norm, we can see the true impact of storage builds this month. By our estimate, April storage will build 68 Bcf higher than the five-year average as a result of the oversupply. This is one of the biggest reasons why natural gas prices aren't higher despite the lower storage levels. In addition, Lower 48 production is likely to increase more from the Northeast, but also Texas. 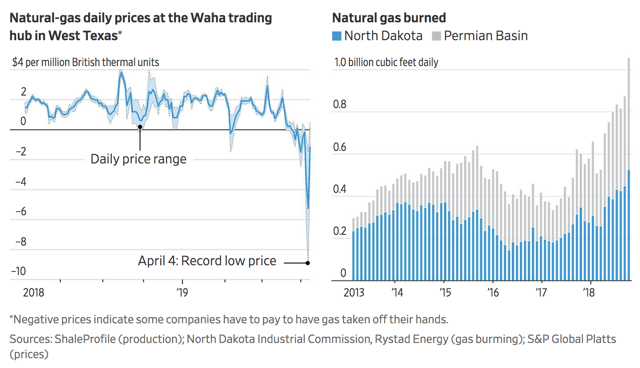 WSJ reported this week that gas flaring in Texas and North Dakota exceed ~1 Bcf/d. Once pipeline capacity comes online in Texas, we expect Lower 48 production to move higher, further dampening the upside in gas prices. In order for the natural gas market to turn into a bull market in 2020, the +~4 Bcf/d of LNG demand will need to come through while Lower 48 production continues to be flat into year-end. We don't think that's a possibility at the moment. The breakeven figure for production is ~92 Bcf/d. If production is higher than that, then we are in for another glut for 2020. For now, we don't see a natural gas bull market this year. Production remains too high.